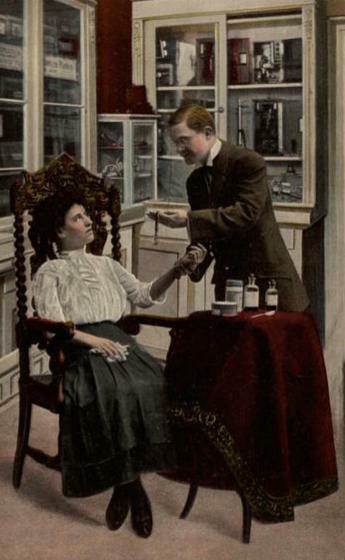 In the late 19th and early 20th Centuries, there were very few trusted commercial medicines to alleviate cold symptoms. 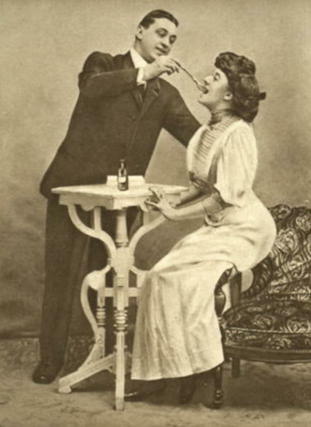 People often relied on folk remedies and home-made treatments to cure a variety of illnesses and injuries. A scene in Jessie Wells illustrates the point. Jessie and her best friend, Mate are sitting outside on the porch one evening when Jessie’s father comes home from work. Dr. Wells came up the walk at this moment, and the two girls arose to give him passage. Horrid doses indeed! 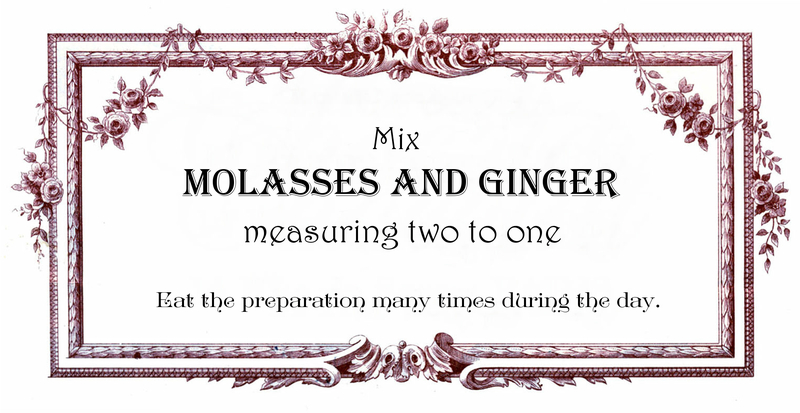 The molasses and ginger cure for a sore throat was fairly common, and it sounds like Dr. Wells believed in its curative powers. In actual fact, the ginger tended to suppress coughing and the molasses soothed the throat. Another home remedy for colds was a mixture of molasses and a few drops of kerosene in a glass of water. As questionable this home cure may sound, it was one of the few cold remedies that didn’t contain alcohol. Put a large teacupful of linseed, with 1/4 lb. of sun raisins and 2 oz. of stick liquorice, into 2 quarts of soft water, and let it simmer over a slow fire till reduced to one quart. Add to it 1/4 lb of pounded sugar-candy, a tablespoonful of old rum, and a tablespoonful of the best white-wine vinegar or lemon-juice. Com mercial medicines also included alcohol. 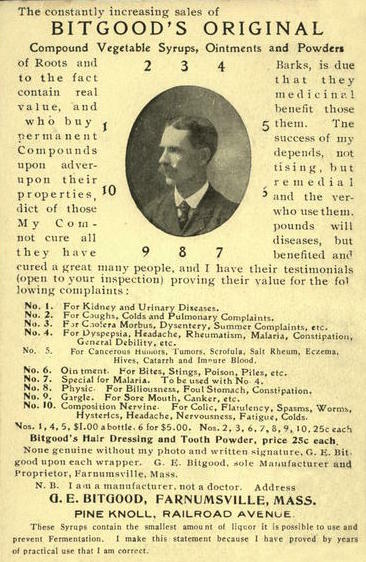 Bitgood’s Original Compound Vegetable Syrup boasted it could cure the common cold, as well as a host of other ailments. The manufacturer was one of the few who revealed that their product contained alcohol, although the ad doesn’t state how much alcohol was actually in the mixture. The majority of commercial medicines did not disclose the alcohol content in their products. 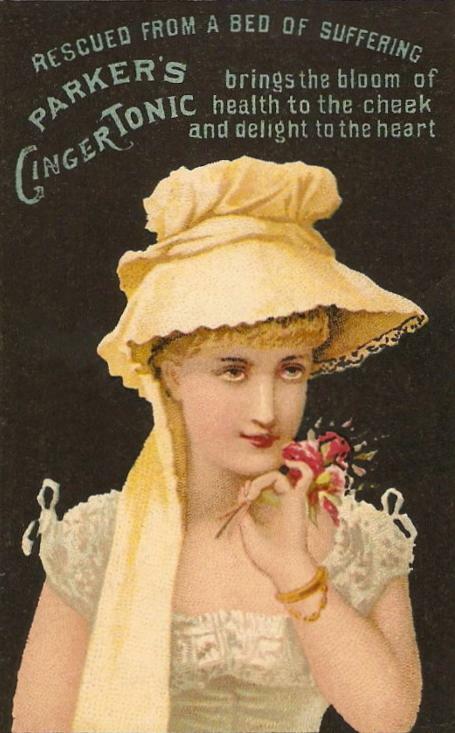 This lovely trade card advertises a ginger cure that sounds just like the kind mothers everywhere mixed up with molasses in their kitchens. The product description on the back of the card touts the benefits of the medicine, but doesn’t list the actual ingredients. Too bad; because, in actual fact, Parker’s Ginger Tonic was 41.6% alcohol—more potent than 80 proof whiskey! Compare that to the average alcoholic content of today’s beer (5% alcohol) and wine (approximately 12% alcohol). It was the rule, rather than the exception, that consumers had no idea that they were dosing family members with alcoholic products; and since many alcohol-laden medicines of the time were specifically marketed to children, mothers often unwittingly gave their little ones rum and whiskey. Little wonder, then, that Isabella Alden often wrote about the dangers of alcohol consumption. At the time her books were written, people usually didn’t know they were consuming alcohol and often didn’t recognize their growing dependence until it was potentially too late.